Daily Eats: Do we really cook fancy every day? This is so true! All the photos, posts, blogs, etc. 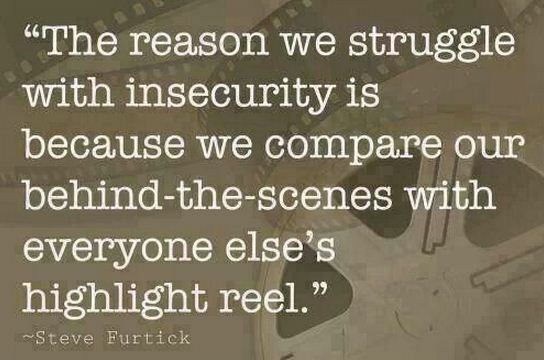 about healthy food or healthy living that run through my Facebook newsfeed, Feedly Reader, and email on a daily basis can be discouraging rather than encouraging sometimes because I’m comparing those highlights from others to our every day. 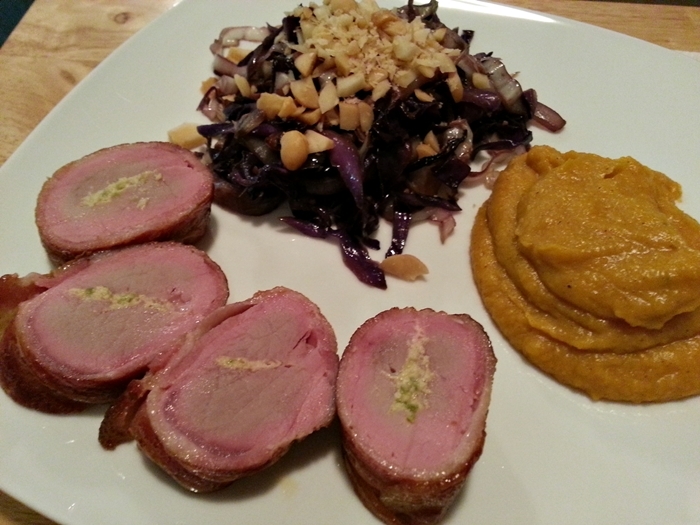 This night we smoked our wrapped pork tenderloin, made mashed butternut, and sautéed cabbage. It might look elaborate but it’s relatively simple; the most time-consuming item is the pork. It takes 3-4 hours to smoke and requires a little pre-planning to defrost and to start cooking early enough. But not every night looks like this. Far from it. I get excited about recipes that Don creates, or when we try a new recipe that combines ingredients or foods in ways we’ve never experienced, and I enjoy sharing that with others. But the reality of our behind-the-scenes is that we aren’t always eating this way. 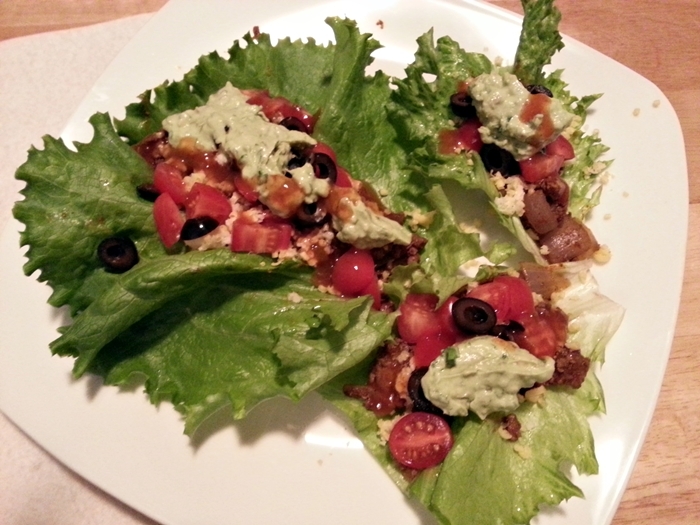 We have plenty of other nights, especially lately, when we don’t even have the energy or time and simply grill some sausage or steak and make steamed veggies, or even pick up pizza or other take out. If you are trying to make changes in your own cooking style or diet, don’t let the highlights of others (us included) overwhelm you. Make small changes. Get rid of things you don’t want in your kitchen. Start stocking it with the types of foods you want to be eating. Experiment. Try a new side dish like our mashed faux loaded baked potato with your next steak. Or try a whole dish that’s new, once a week; it doesn’t have to be every day that you try something new. Over time, as you learn new ways of combining foods or new cooking methods, you will find yourself incorporating them more and more without realizing it. I have been continually perplexed for some time that one of my very early recipe experiments (Beef Stew and Almond Flour Dumplings) was constantly popping up in my stats traffic. Like daily. I kept wondering, what IS it about that recipe/page? Did I tag it in some way that made it more searchable? I couldn’t quite figure it out. So recently I took a few extra minutes to dig around in my traffic stats to see if I could determine the source from there. Lo and behold. It was PINTEREST. Really? People are pinning my stuff? Aww, shucks. NOW I get it. And I suddenly understand how powerful Pinterest can be as a social media tool. BTW, I’m completely humbled by this discovery. A very warm THANK YOU to all the folks who are pinning things I’ve shared. It is a trip to see all the pins to my blog and to be able to see what people are pinning and saying. I didn’t even know you COULD see a summary like that. Apparently, you can. As for the dumplings, which is why people are pinning that first post I mentioned, they are ok but not out of this world. Definitely not the first thing that would come to mind if you asked me to name my favorite dish or recipe. I’ve only ever made them a couple of times. I’m SURE there are other recipes out there that have better results. But if it helps get people interested in alternative ways of cooking and baking, or connects them to some other new idea, product, or food, and perhaps leads to something more, then I’m pleased to be part of that journey.